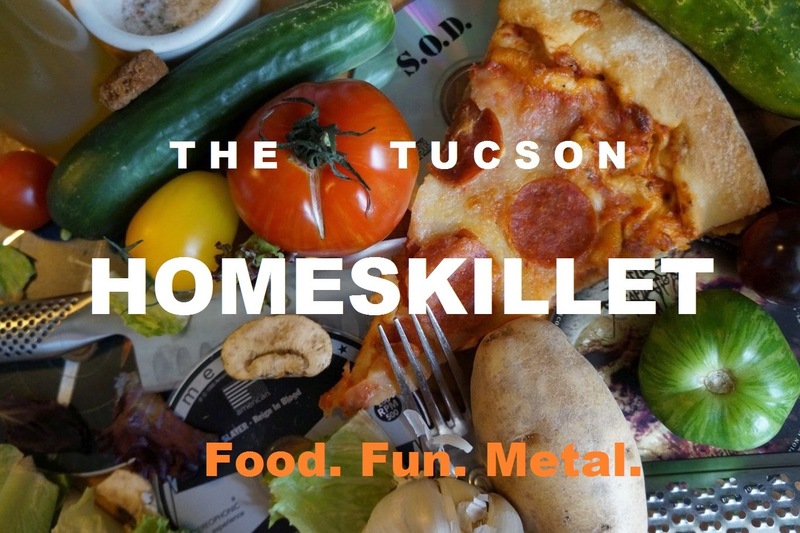 The Tucson Homeskillet: Trident II : Eclectic Food n Booze! Trident II : Eclectic Food n Booze! 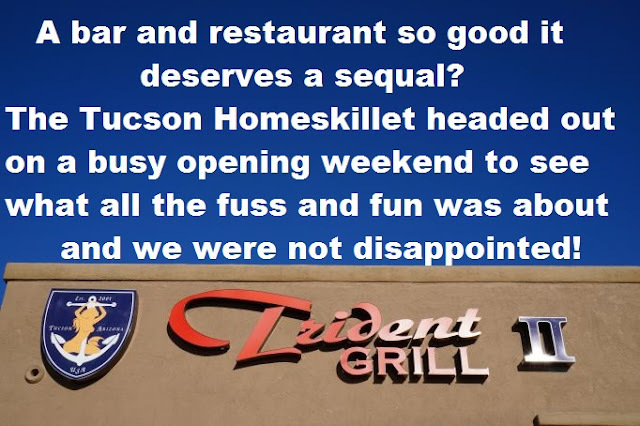 We were first hipped to the Trident Grill not long after moving here to Tucson in 2006. It was at the very edge of football season, perhaps even in pre-season, and my Redskins fan friend had only one destination in mind for the game. Yep, you guessed it, the Trident Grill. "You're going to love this place," he said rather enthusiastically as we exited the car and approached the front door. "Food is off the chain. And if your a 'Skins fan like I am this is the best place to catch a game." We walked in and, boy, he wasn't kidding. Redskins jerseys and hats were adorned by at least 80% of the customers in the tightly packed open space. It was so busy that we almost bounced but a friendly server assured us there was space so we stuck with the original plan and stayed. Somehow we found a bit of standing room only close to the bar, ordered a couple of pints and then moved our attention to one of the various big screens showing the game. Not too sure who the Redskins were playing (the Vikings maybe?, dude, this was like almost ten years ago!) but the dedicated crowd were in a fervor with almost every play and pass. Now, at the time, I wasn't much of a football fan, so after the first quarter I became not that interested in the game and decided that I was a bit hungry. I asked a server for a menu and when it arrived it was pretty impressive if not intimidating. Back then the menu was really big, like food option big. Mainly focused on seafood items, the list of dishes ranged from small bites, bar food to beefy sandwiches and, of course, really massive offerings from the sea, but, like, a lot. This was the kind of menu you'd see in a space twice if not more so larger. When I glanced up towards the kitchen area I saw that it was a cramped space in the back of the restaurant with three to four guys moving, like running to get orders out on time. With a menu this packed in a space this tight I was hesitant to order anything at all. Looking closer, the dupes up on the line were at least twenty in so I made a mental note to come back later when it wasn't game time and order some food. So I drank more beer and watched the game with my friend. Then the Redskins lost. My friend was sad as were most of the patrons. Some got mad. When I finally got a chance to go back to the Trident to actually eat their food, I was a bit shocked to find out their menu had changed. It was scaled down, it was on a one sheet laminate and the prices matched the options much easier than the first time I was there. It became pretty clear that after a few Redskins games with a rather "ambitious" menu for such a mid sized area they had to meet the reality that a cramped line with a few guys on top of each other can't really bash out a Cheesecake Factory sized menu. Okay, maybe it wasn't that big but...it was pretty imposing. We got some crab cakes and calamari. Delicious. Very tasty, fresh and cooked to perfection. Then I think I got the Wildcat Burger, which came equipped with bacon, cheddar cheese, onion rings and the house hot bar-be-que sauce. Amazing. She-Ra got the clam chowder which was some of the best she or I have had in quite some time. It was actually nice to say the food was well worth the wait. Oh and don't forget about the beers. Those are good too. It was settled then. We became regulars. Great happy hour specials, good food, awesome service, interesting beers on tap...who wouldn't be? 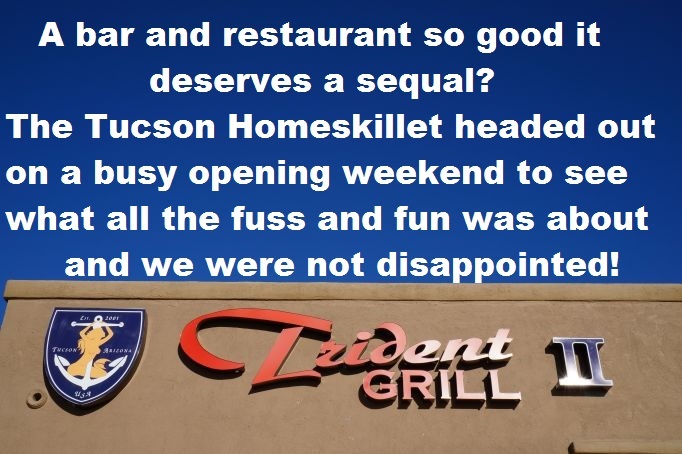 Then sometime in late 2015 word got out in the Tucson culinary underbelly, that owner Nelson Miller and his staff were considering opening up a new Trident Grill, possibly in the Plaza Palomino where the old Jackson Tavern used to be. Pretty soon those rumors became true as construction began right across the way from Vero Amore. In fact, if you read my haphazard escapade during the Super Bowl, that was the first time I laid eyes on the facade, which was to be called, cleverly enough: Trident II. Trident II...I like that. I mean, some of my favorite movies are sequels, so why not just put a "Part 2" next to the original money making name? "The Empire Strikes Back"? Better than the original. "Hellboy 2"? Far superior to the first. And let's not forget, the only reason they made "Grease" is that they could make "Grease 2". No, really, I swear. And then, after all the rumors slowly became reality and then seeing it come to life, Trident II finally opened in early 2016. Immediately I knew I had to write about it for the Homeskillet. It just seemed like too much awesome to pass up. So on a lovely early spring afternoon I made my way to the now open Trident II only to find it just as bumpin' and packed as the original down by the U of A. Luckily I had a chance to hang out with manager Danny Gallego, who was very busy juggling issues between the bar and kitchen, and even in the really early stages of the new restaurant being open, he explained to me the reasons for expansion and the challenges that come with it. "Well if you ever tried to dine at the original Trident Grill on any U of A game, be it home or away, you find it hard to get a seat," Danny explains with a shrug and smile. "As staff we do what we can to accommodate everyone but that is a mid-sized restaurant at best and can only hold so much. So we felt as a team that this location on Swan would be well received by all the surrounding neighborhoods and the traffic here, which there is plenty of, could create the volume of customers that is needed." Sure the original Trident is a success and by the head count in it's sister/brother store, they are well on their way to even more progress. Yet in the early trials of a new venture there are always obstacles and hurdles that out even seasoned restaurant workers to the test. "Everything is a challenge," notes Danny trying to maintain the crowd during a busy happy hour, "some are lessons learned and some not so much. Every restaurant owner has a plan in their head how everything will fall into place once the dust settles and the construction is done. Things out of your control pop up out of nowhere! Such as kitchen equipment working fine then suddenly shutting down right before service. Luckily you have the tools and knowledge to troubleshoot the problem if your tech guy is off skiing in Colorado when the POS (point of sale, the tickets you see streaming out of little black machines at the bar or on the line) system just decides to stop operating." Okay, so we get that running a busy restaurant is tough work, but now for the fun stuff: The food! Me personally am a fan of most of the items on the menu. No really, I haven't had a bad meal once, be it just a snack or a full on rager of an eat-fest. Now, I have my favorites but I just had to ask what Danny's favorite menu item was. "Oh man," he says clapping his hands and leaning his head back as if dreaming. "Hands down the Maryland crab cakes. Unbelievable. One of our kitchen guys, Jason, is so creative. He comes up with the most outrageous food. We are so lucky to have a really talented kitchen staff like we do. Those guys earn their stripes!" "I wouldn't say what we are doing here 'separates' us from the original that owner Nelson (Miller) started almost fifteen years ago, but more of a 'continuation'", states Danny when I asked about the concept of Trident II and whats contrastive from the original. "Right now I'd have to say the location would have to be the obvious answer. "We as a company consider all of our patrons family and that, right there, is what really separates us from most other restaurants. I mean, look at this," extending his hands to the throng of people seated or waiting to be. "This...this is a lot of family!" What is he looking forward to in the near future. It didn't take him long to answer as he beamed saying, "Oh man, I am really looking forward to the warmer months coming up. Our patio is completely shaded after 10am and with these big ol' fans we got installed and going on here, it just might create the perfect environment to sit back, enjoy the day with a tall icy beer without getting scorched by the sun. 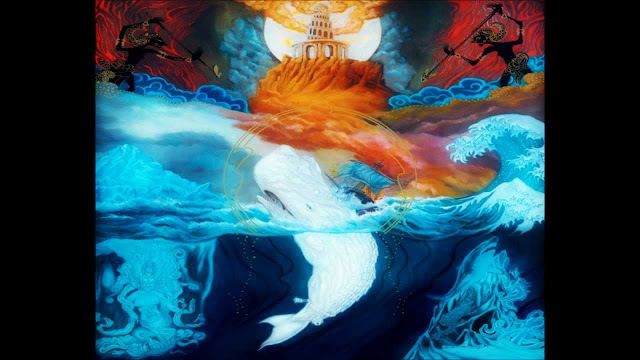 "We just want to create the same experience as the original and just feed off of our successes. It's funny, you'd be surprised at how many people here at the new location have never even heard about the original down on Speedway. But, hey...big shout to all Team Trident. Because of the success of the original that's why we've had the fortune to open Trident II!" 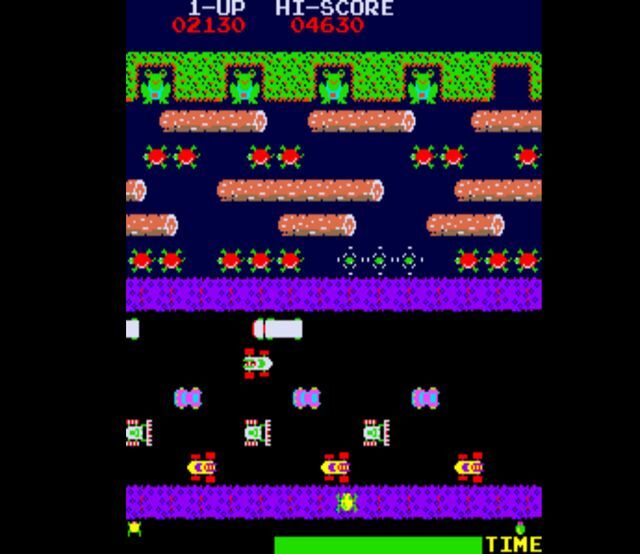 Feeling like Frogger in the middle of a busy highway trying to take pictures, I assessed that I had gotten what I needed, finished my beer and took off. Just like the first time at the original Trident, just as busy and lively as that initial visit, I told myself that I would be back to, yes, eat the food. Have you had their charcuterie boards, dubbed "Nelson's Love Plate"? Oh yeah, I'm gonna need some of that soon. For now I felt the love of everyone at Trident II and know that even further prosperity is headed their way. Just don't go back to those huge silly menus. You're doing fine now. Just...fine. You know what I'm trying to say, right? Okay.